"To be or not to be..." - possibly the most famous Shakespeare line of all! 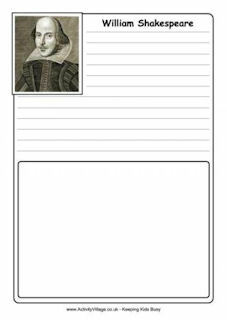 Kids can use our printable page to copy out this an another famous line from Hamlet. "If you prick us, do we not bleed?" Kids can copy out these well-known lines from Shylock in Shakespeare's play, the Merchant of Venice. Here are three lines from the Shakespeare play, Merry Wives of Windsor, for the kids to copy out. A great way to learn them! William Shakespeare's great play, Romeo and Juliet, holds a special place in many Shakespeare lovers' hearts. Help children to recognise lines from the play and remember them with this simple copywork sheet, ready to print.